Yes, it is my turn on the blog and yes, I have posted this card before on my blog! However, life is rather chaotic lately with my mom and mother in-law needing care. My Sweet Petunia's Design Team wonderful team lead - Lydia Fielder - said I could re-post this here. You might wonder what I used the MISTI and Cut Align for in this card! I used my MISTI for all the repeated stamping of the flowers and the leaves. I still have extra flowers and leaves left. I stamped a total of 10 flowers and 10 leaves and heat embossed them in about 20 minutes. I hope to make another card soon with the leftovers. I store leftovers in a small dish that sits on my desk. Creating leftovers is part of the brilliance of multiple stamping with the MISTI. The Cut Align - my new best friend - I used that for the sentiment strip on this card. In fact, I have been using it for all sentiment strips since Lydia sent me one. I am trying to figure out how to feature it in a video without featuring my head leaning over it lol. As a person with a tremor I feel very blessed to have this tool. I do have a video up on my You Tube channel - Susan Wymer Card Designs. The content about the giveaways no longer apply as the comments are closed but you can see how I made the card. Thanks for understanding my posting a repeat card over here. I hope to be posting something more interesting and informative for my next post. Products Used: I am using compensated affiliate links at no further cost to you. 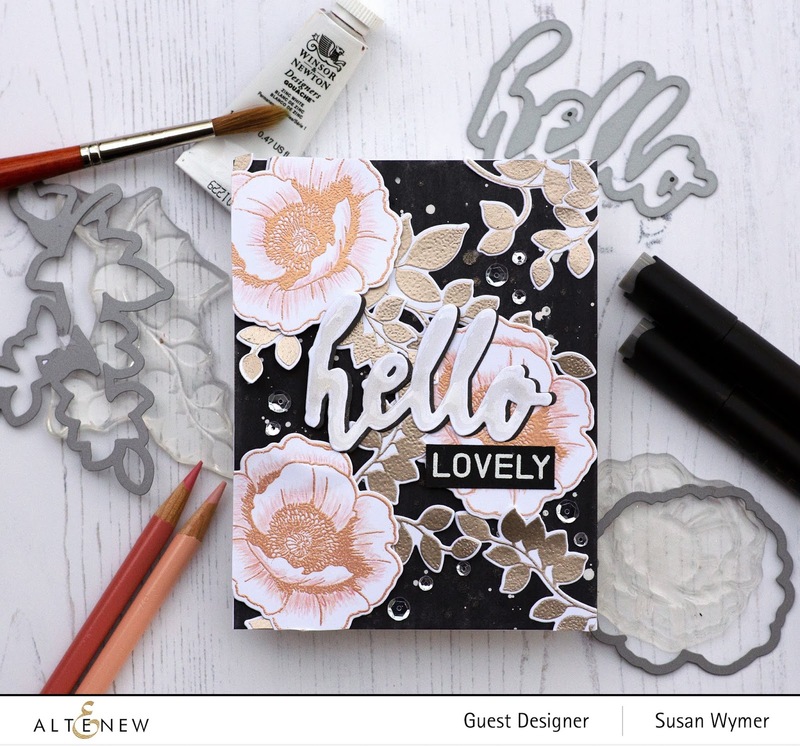 I received the stamps and dies used in making this card as part of my guest designer work for Altenew. I selected the Altenew products I used because I loved them and I love working with Altenew and My Sweet Petunia. I was given the Cut Align as a gift from a very dear friend. I purchased my own MISTIs because I think they are essential for my stamping process. Beautiful card! Stunning colors and design.